It's a rainy day here. Quiet, gray, begging for quiet time with my Bible and an English Breakfast Tea Latte. This NIV Bible is a Compact size, which is the size of a larger paperback book, bigger than my travel version but small enough to tuck into my purse. The embossed leather and smooth leather in lovely robin's egg blue and a deep turquoise are stunning. The pages have silver edges and blue pages for the devotionals. There are 365 devotionals throughout the book, one for every day. The devotions are focused on family and children, but the lessons are applicable to everyone. 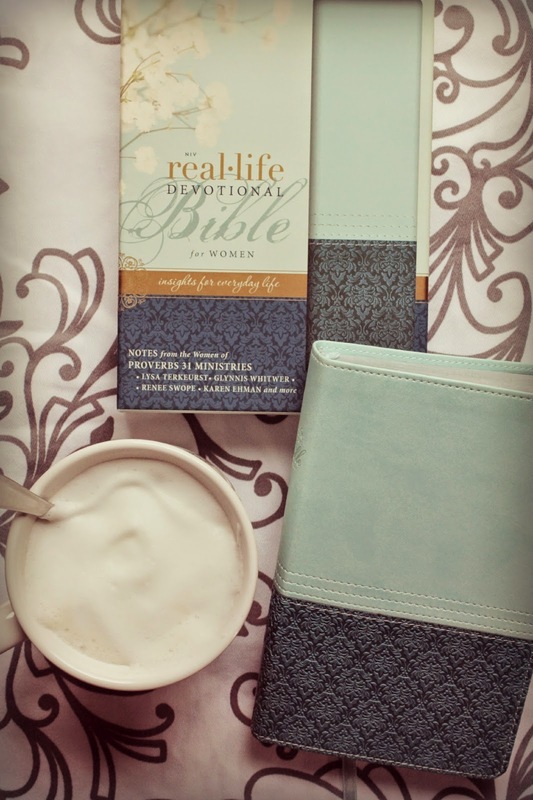 This Bible would make an absolutely lovely gift or a gift to yourself. It's a real beaut, and so is the box, a perfect box to keep cards or notes in. Do you have a hardcover or softcover Bible? This is actually my first softcover one! This looks amazing! I think I am going to put this on my Christmas list. I always go with a softcover bible. Easier to carry with me.